DC/DC converters 12 to 8.5 volts for using a Playstation 2 in a car or boat from PowerStream, Buck-Boost .
. It is possible to use the Playstation2 slim in a car in several ways. Our PST-DC128.5-11 is the premier way to do it, since it supplies superbly regulated 8.5 volts, filters noise and spikes from the car's electrical system, and is highly efficient. You can also use an DC/AC inverter, but these often cause noise in the video, audio, and/or car radio due to the modified sine wave output. 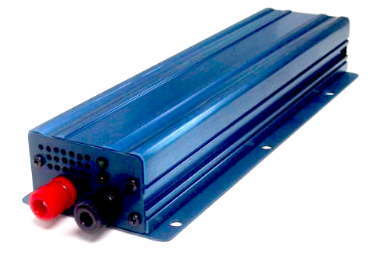 There are also linear regulators available which are inefficient (they put out up to 55 watts of heat) and don't have the same degree of isolation from noise, spikes and ground loops. Motors: Running motors from these units will void the warranty. Designed for converting an unregulated/unstable dc voltage to a regulated dc voltage of 8.5 volts.